San Francisco, the hotbed of marijuana law reform, has frozen medical cannabis dispensary permitting this winter as the City — and dozens of others across the state — nervously await a decision by the California Supreme Court on the very legality of such permits. Nine groups that are seeking permits to open new San Francisco clubs — mostly in the Mission — have been caught in limbo, the Department of Public Health told Legalization Nation. San Francisco currently has 26 permitted dispensaries. However, an October decision by California's Second District Court of Appeals, in the case of Pack v. Superior Court, states that local regulations — such as permits and fees — are preempted by federal drug law. California cities and counties can either help Uncle Sam prosecute the Drug War or stand idly by, the appeals court found. But local jurisdictions can't actively contravene federal law with medical marijuana distribution permits, fees, and mandates for lab testing. As a result, progressive cities with dispensary regulations have paused their programs, cities and counties opposed to medical marijuana are using Pack to ban all clubs, and unregulated clubs now have legal cover to open without any rules. The city of Long Beach is planning an appeal, and the California Supreme Court has until February 8 to decide to either hear it or let the appellate decision stand. Their decision will be pivotal, lawyers say. Shannon said his office will go to the Long Beach City Council January 17 and request a ban on all dispensaries until the Pack appeal is settled. There are about sixty dispensaries in Long Beach — and no one has a permit under the city's spring 2010 ordinance, which called for a lottery system and steep fees to determine which operators could stay open. It also mandated safety testing. Long Beach dispensary operator Ryan Pack, represented by attorney Matt Pappas, sued Long Beach over its permit program in September of 2010. Pappas argued that the federal Drug War preempts localities from picking winners for pot permits. Astonishingly, the appellate court upheld the interpretation in October, prompting Long Beach's appeal to the state Supreme Court. The American Civil Liberties Union, several cities, and national marijuana patient lobby Americans for Safe Access have denounced the appellate court's decision and asked the Supreme Court to wipe out its existence by de-publishing it. Pack stymies regulation and leads to bans that prevent safe access, they say. Three other California appellate courts have ruled to the contrary on issues of federal preemption, critics note. Shannon agrees. “The law on this issue is chaotic, and has not been consistently applied,” he said. Los Angeles City Attorney Asha Greenberg seemed exasperated. “With Pack we can't regulate, we can't control what kind of quality products people are getting when it comes to things people eat, pesticides, potency, any of that.” Los Angeles is also mulling a ban again. Seven-year old delivery-only dispensary The Green Cross has been applying for a permit to open a physical location at 4218 Mission in San Francisco for a year. Manager Caren Woodson said the city put her permit hearing on hold in November, citing the Pack case. She called the situation “unfortunate” and awaits the Supreme Court's decision. Five other groups are seeking permits on Mission. 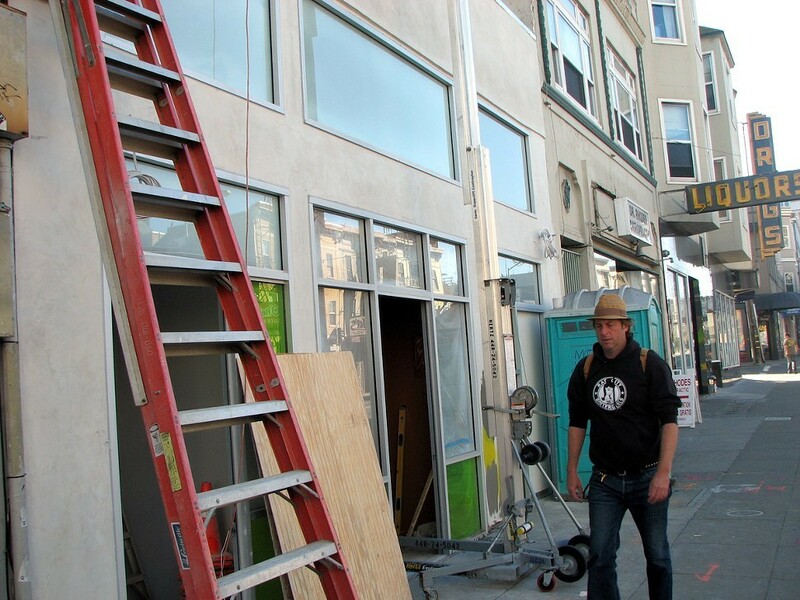 The popular dispensary The Green Door is seeking a second location on Lombard Street. However, some cities are advancing: Oakland intends to permit four groups to open new dispensaries by the month's end, and in December, the City of Richmond permitted its first three dispensaries, said city attorney Mary Renfro. Cities might be able to re-word their permitting schemes to survive preemption, Pack notes. Arturo Sanchez, assistant to the city administrator in Oakland, indicated it could take three weeks to four months for the city to rewrite its ordinances around Pack, if it's upheld. But Shannon said rewording ordinances to comply with Pack is too hard. It would mean switching from a system of “permits” to something like a “certificate of non-disallowal”. “It doesn't make any sense,” Shannon said. Robert Raich, an Oakland lawyer and advisor to a dispensary permit applicant, expects the Supreme Court to de-publish Pack. The high court has a history of upholding state law in the face of federal preemption challenges, he said. “It was wrongly decided and it will be de-published or review will be granted," Raich said. "Eventually the state Supreme Court will reverse it." Still, the Pack decision exposes the fault line running through the national terrain of marijuana law. The Green Cross — 4218 Mission St.
Bay Area Compassion Health Care Center, Inc — 2139 Taraval St.
Tree-Med, Inc — 5234 Mission St.
Mission Organics Center — 5258 Mission St.
Mission Herbal Care — 3139 Mission St.
Grassroots — 952 Mission St.
Axis of Love — 1260 Mission St. Happy Days — 100 Sickles Ave.
Cambon Connoiseur Cooperative — 33 Cambon Dr.
Bay Area Medicinal Facility — 17 Halleck St.
JM Collective — 471 Jessie St.
Green Door — 2414 Lombard St.
Market St. Cooperative — 1884 Market St.
Re-leaf Herbal — 1284 Mission St.
Med Thrive Co-op — 933 Mission St.
1944 Ocean Collective — 1944 Ocean Ave.
Bernal Heights Collective — 33 29th St. Sanctuary — 669 O'Farrell St.
San Francisco Med Cannabis Clinic — 122 10th St. The Vapor Room — 607A Haight St. The Divinity Tree — 958 Geary St.
Good Fellows Cannabis Club — 473 Haight St.
Green Cross — 230 11th St. The Green Door — 843 Howard St.
Hemp Center (aka Patient Place) — 4811 Geary Blvd. Hope Net Co-Op — 22 9th St.
Ketama Collective — 14 Valencia St.
Grass Roots — 1077 Post St.
B.A.C.H. — 1545 Ocean Ave.
Mr. Nice Guy — 174 Valencia St.
BASA — 1328 Grove St.
Valencia Street Caregivers — 208 Valencia St.
SPARC — 1256-1258 Mission St.
Igzactly Health Center — 527 Howard St.
Shambala Healing Center - 2441 Mission St. The Apothecary — 2095 Market St. Correction: The original version of this post erroneously stated that Robert Raich is a dispensary permit applicant. He is an advisor to an applicant.